Ten people are dead, and 15 more are in hospital, after a rental van mowed down pedestrians for close to three kilometres in north Toronto on Monday afternoon. Emergency crews received a number of frantic calls around 1:30 p.m., after a white rental van mounted the sidewalk at the busy Yonge Street and Finch Avenue intersection and struck a number of people. From Yonge and Finch, the van – bearing a Ryder Truck Rental and Leasing logo – fled southbound on Yonge for several blocks toward Sheppard Avenue, hitting more people before coming to a stop on Poyntz Avenue. There, an eyewitness video shows the driver – standing next to the damaged van – pointing his hands at a police officer. “Kill me,” he yells, repeatedly gesturing his hand from his back pocket toward the officer. “No. Get down,” the lone officer calls back. Eventually, the man drops the object on the pavement and obeys the officer’s orders to get on the ground. 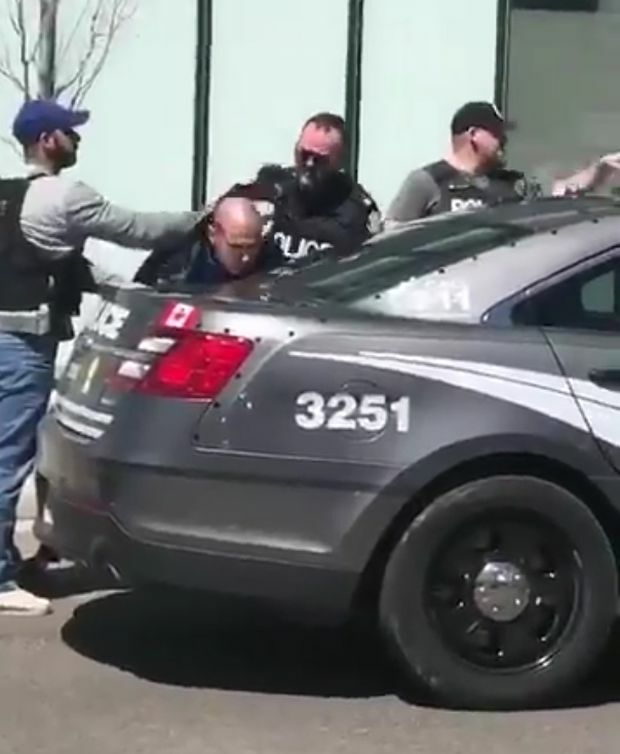 He was arrested at 1:52 p.m.
Toronto Police Chief Mark Saunders confirmed Monday night that the suspect is 25-year-old Alek Minassian. He said police have set up two hotlines; one to provide support to victims’ families (416-808-7066) and one for witnesses to provide information (416-808-8750). “We need every piece of this puzzle we can,” Chief Saunders said. Michele Kelman, who works at an IT company with an office on Yonge Street, said she was walking back to work after lunch with a friend when they heard screams behind them. My friend was gone. I couldn’t find her body for a while. There were a few around. And there were people trying to bring her back. Ms. Kelman said she turned and saw objects and bodies flying through the air and the front end of a white van heading straight down the sidewalk toward her. She turned instinctively, trying to shield herself, and the truck rushed past without touching her. Ms. Kelman said her friend did not survive. She declined to identify her because her family hasn’t yet been notified. “I thought maybe she was still alive. I thought maybe she ran,” Ms. Kelman said. “There were bodies all over,” she said, her eyes red, her hands shaky. Saman Tabasinejad was walking along Yonge, just south of Finch – the same block where she lives – when she stumbled across the immediate aftermath. “I saw body bags. I just saw one after the other, after the other. At least five,” she said Monday afternoon. Ms. Tabasinejad, who is running as the Ontario NDP candidate in the provincial riding, had been canvassing the area all morning – including the very intersections where people were later hit. The sidewalks had been full of families and people out enjoying the sunny weather after a long winter. Aerial footage from the scene showed multiple victims on the sidewalk covered with orange tarps, as police taped off the surrounding blocks. The area resonated with the sound of firetruck and ambulance sirens and the thuds of rotors of helicopters flying overheard, as police spoke with witnesses. The first call was vague, he said, and didn’t prepare first responders for the scene they would arrive on. “Basically from Yonge and Finch all the way down to Yonge and Sheppard, it was pure carnage. Debris everywhere. [I] can’t really describe it. Victims everywhere,” he told reporters outside the hospital. He said that there were already casualties when first responders arrived on scene. “Multiple people were injured. Multiple people were deceased,” he said.